The only thing better than fiddling in the shade is sitting in the shade and listening to the music. 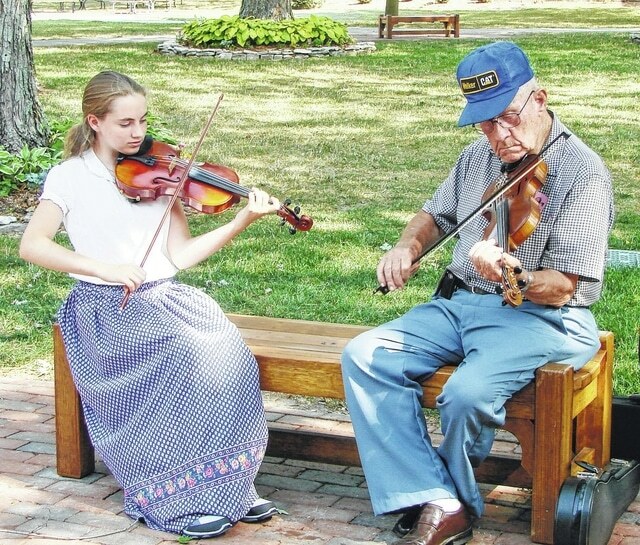 On Saturday, July 11, people will gather from far and wide to enjoy the annual fiddle contest at Sauder Village, which begins at 1 p.m. It is all part of Summer on the Farm. ARCHBOLD – Families from throughout the region will be gathering at Sauder Village on Saturday, July 11 to experience life on an Ohio farm more than 100 years ago. With festive fiddle music and great hands-on activities like making rope, grinding sorghum, making rag dolls and even a Pie Baking Contest – Summer on the Farm/Fiddle Contest continues to be a favorite summer event at Sauder Village. Throughout the day, a number of unique activities will be offered to allow guests to experience life in the past on an Ohio farm. At Natives and Newcomers guests can see a turkey being cooked over the fire and try a traditional Native American craft. Children can also make hand-cranked ice-cream, roll out a pie crust, make rag dolls, try knitting/quilting and participate in hoop rolling races. Other traditional farm activities include making rope, shelling beans, grinding sorghum and taking a barnyard tour with the historic farmer. Children can make a fairy wand near the Fairy Garden and there will be a “Story Hour” and activity at Little Pioneers Homestead for young guests to enjoy. Another highlight of this fun-filled day is the annual Fiddle Contest. The Fiddle Contest will begin at 1 p.m. with fiddlers from throughout the region gathering to compete in one of three categories – student, open and senior. Each contestant will have five minutes to perform a hoedown and a waltz using old time style and techniques. Judging will be based on a point scale in the areas of fiddle style and technique, rhythm and timing, difficulty of selection, tone quality, showmanship and crowd appeal. Fiddlers will also perform on the Village Green from 10 to 11:30 a.m. and again after the Fiddle Contest. New this year, a Homemade Pie Baking Contest will be held during the Summer on the Farm Event. Judges will be looking for traditional recipes with an old-fashioned flair and pies will be judged on appearance, flakiness and flavor. For more details or a Pie Contest Registration Form visit www.saudervillage.org or call 419.446.2541.